The 28th instalment of Guelph's Hillside Festival has passed, but you can relive the whole experience from the comfort of your own home. 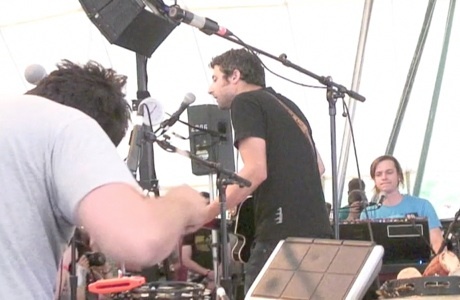 Above, watch Karkwa perform "Oublie pas" from their 2008 album Le volume du vent while watching clips of the many different workshops, crafts and performances that happened at this year's Hillside Festival. Below, performers at this year's festival answer questions from our infamous Questionnaire. Find out how members of Snailhouse, Light Fires and Karkwa spoil themselves and what the first album Doug Paisley, Hannah Georgas and Dan Mangan ever bought with their own money, while listening to Hollerado perform "Good Day at the Races" from their 10" record, Margaritaville 2: The Reckoning.